All our sisal twine/string are centre pull and is made from 100% natural fibres. It is suitable for use with parcels and is also widely used by many for handicraft projects. These Twines are very traditional in appearance. Their hairy and rough properties have been very popular for traditional general purposes, and they have been very popular for wholesale applications. 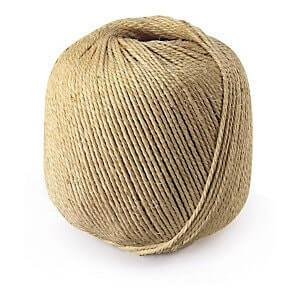 Uses of this untreated twine vary from upholstery, garden twine, parcel tying, and for the use on clothing/swing tags. It is available in 3 different spools/balls, two of them being 3-ply & one a 2-ply twine in different diameters and lengths.